US an 'Epidemic Surveillance Society"
The map below is from a joint 2007 report by the Electronic Privacy Information Center and Privacy International. Unfortunately, they do not have a more recent US report. I also learned about the inspiring story of the Battle of Athens from Ross' book. In 1946, WW II vets and other locals successfully took up arms against a corrupt, local Democratic Party regime in Athens, TN, the county seat of McMinn County. In a world where so many people are passive and disengaged from the major questions of political and social life, I expect I will always find righteous resistance to be inspirational. Yet, I am also keenly aware, that violent resistance is almost always a blind alley, which typically empowers not necessarily the kindest or most just among us but rather those who are adept at inflicting or orchestrating violence. The unofficial organization of the veterans is torn by dissension. "We abolished one machine only to replace it with another and more powerful one in the making." These nine installments, using the first lines of seven literary classics, were all published on January 14, 2013, by novelist Teju Cole via his Twitter feed. 1. Mrs Dalloway said she would buy the flowers herself. Pity. A signature strike* leveled the florist's. * According to ProPublica, a "signature strike" is a drone attack targeting "apparent militants whose identities the U.S. doesn't know." 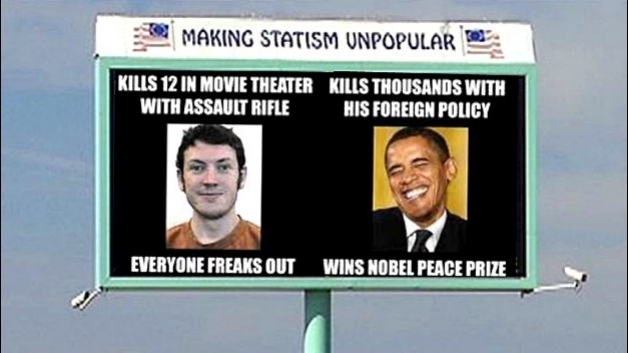 ... if guns are outlawed, only the government will have guns. Only the police, the secret police, the military. The hired servants of our rulers. Only the government--and a few outlaws. I intend to be among the outlaws. Source: Edward Abbey. "The Right to Arms." Abbey's Road (1979) p. 132 as qtd. in Edward Abbey: A Life by James M. Cahalan (University of Arizona Pr., 2001) p. 225. Source: William S. Burroughs. "The War Universe: Interviews with Raymond Foye." Grand Street. No. 37 (1991) p. 107. 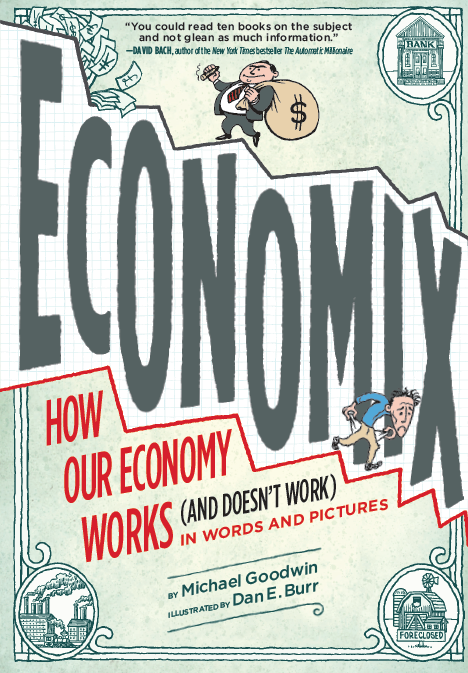 The excerpts below are from Economix: How and Why Our Economy Works (and Doesn't Work), in Words and Pictures by Michael Goodwin and Dan E. Burr. All page numbers below are from Economix or the book's online references. No society can surely be flourishing and happy, of which the greater part of the members [the workers] are poor and miserable. It is but equity, besides, that they who feed, cloath and lodge the whole body of the people, should have such a share of the produce of their own labour as to be themselves tolerably well fed, cloathed and lodged. -Adam Smith qtd. in Economix, p. 27 (Goodwin quotes only the first sentence); Adam Smith, Wealth of Nations, p. 90. People of the same trade seldom meet together, even for merriment and diversion, but the conversation ends in a conspiracy against the public, or in some contrivance to raise prices.-Adam Smith qtd. in Economix, p. 28; Smith, p. 148. The proposal of any new law or regulation of commerce which comes from [capitalists], ought always to be listened to with great precaution, and ought never to be adopted till after having been long and carefully examined, not only with the most scrupulous, but with the most suspicious attention. It comes from an order of men, whose interest is never exactly the same with that of the public, who have generally an interest to deceive and even to oppress the public, and who accordingly have, upon many occasions, both deceived and oppressed it. -Adam Smith qtd. in Economix, p. 29; Smith, p. 288. Great is the usefulness of Ricardo's method. But even greater are the evils which may arise form a crude application of its suggestions to real problems. For that simplicity which makes it helpful, also makes it deficient and treacherous. -Alfred Marshall qtd. in Economix, p. 40; Alfred Marshall, Money, Credit, and Commerce, p. 190. This is a comment on the pitfalls of taking economist David Ricardo's economic models too seriously. Its limitations are so constantly overlooked, especially by those who approach it from an abstract point of view, that there is a danger in throwing it into definite form at all. -Alfred Marshall qtd. in Economix, p. 70; Alfred Marshall, Principles of Economics, p. 461. This is a comment on the pitfalls of taking Marshall's own market equilibrium models too seriously. An industrial system which uses forty per cent of the world's resources to supply less than six per cent of the world's population could be called efficient only if obtained strikingly successful results in terms of human happiness, well-being, culture, peace, and harmony. I do not need to dwell on the fact that the American system fails to do this, or that there are not the slightest prospects that it could do so if only it achieved a higher rate of growth of production. -E. F. Schumacher qtd. in Economix, p. 162; E. F. Schumacher, Small Is Beautiful: Economics as if People Mattered, p. 96. All for ourselves, and nothing for other people, seems, in every age of the world, to have been the vile maxim of the masters of mankind. -Adam Smith qtd. in Economix, p. 198; Smith, p. 444. Everything the communists said about communism was false. Everything they said about capitalism was true. -Economix, p. 242; William J. Duiker & Jackson J. Spielvogel, World History Since 1500, p. 763. This is a bitter joke that Russians reportedly told one another in the wake of devastating economic reorganization after the collapse of the Soviet Union--the rise of the oligarchs. See also: "3D Printed Guns Render Gun Control Moot" by Tony Cartalucci on the Land Destroyer Report. 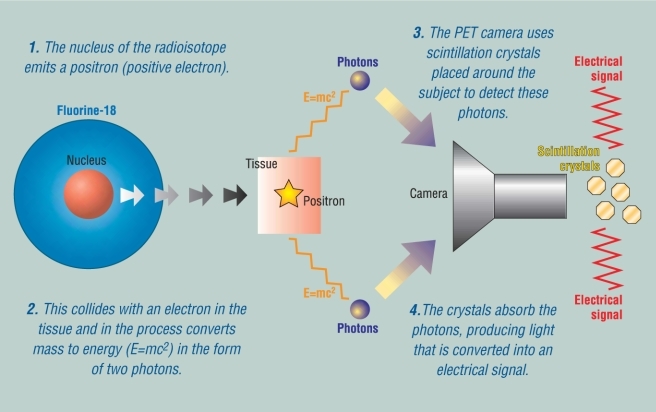 Positron emission tomography (PET) uses ionizing radiation to produce detailed, three-dimensional, functional images of living organisms. The images are produced using a radioisotope, a gamma radiation detector, and a computer system used to manage and display the data collected by the detector. The detector and computer combination may be thought of as a PET scanner. The US National Oncologic PET Registry lists 2,272 facilities that are approved to conduct PET scans for cancer screening or monitoring. Thus, the use of these machines in the US, while perhaps not exactly routine, is not rare or exotic. But there is something exotic about PET scans--they depend upon matter-antimatter annihilation to produce their images. Our everyday world is made up of matter and energy (which are convertible). Atoms are a basic unit of matter comprised of subatomic particles called protons, neutrons, and electrons (except the most common form of the element hydrogen has one proton, one electron, and no neutron). Likewise, antimatter is comprised of antiparticles which have the opposite charge and quantum spin of ordinary particles (there are no known naturally-occuring antimatter atoms). Antimatter particles ("antiparticles") are extremely rare. According to physicist Brian Odom: "In molecular gas clouds in our galaxy, there is less than 1 antiproton for every 1015 protons." Nevertheless, antimatter is produced naturally by cosmic rays colliding with the Earth's atmosphere, lightning, and the beta decay of natural occurring radioisotopes, such as the Potassium-40 found in bananas. Any way, let's get back to the PET scanner. The figure below illustrates how it works using an artifically-produced radioisotope, fluorine-18 (18F) as an example. If it is intravenuously administered in the form of the glucose ("blood sugar") analog 18-fluorodeoxyglucose then the 18F will be concentrated differentially based upon different rates of glucose metabolism. For example, cancer tumors typically have higher rates of metabolism than surrounding tissue. 18F has a half-life of 109.8 minutes. So, after 109.8 minutes half of the 18F atoms will have decayed into the rare, but stable, oxygen-18 isotope, usually (96.73% of the time) by emitting a positron (an antiparticle also called a "positive electron"). That positron will immediately collide with an electron (a negatively-charged matter particle). When it does the positron and electron will annihilate each other--mass is converted to energy--yielding two 511 keV gamma photons or gamma rays. These pass through the patient's body and are detected by the gamma ray detectors. ... you cannot declare war on terrorism without yourselves becoming terrorists. ... terrorism is a war of the poor and war is the terrorism of the rich. 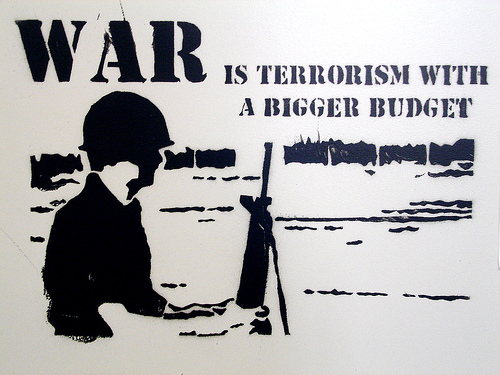 War is not a tool in the fight against terrorism. Source: Peter Ustinov. "Der Krieg ist der Terrorismus der Reichen." Die Welt. April 22, 2003. Image by spanaut. Some rights reserved. I found quite a few articles about the billboard pictured above. It appeared in Caldwell, ID last summer. None of the reports I saw allowed that the sign's creator might just have a point. Caldwell Mayor Garret Nancolas opined: "It's a private sign on private property and protected by the First Amendment, but this message crosses the line by politicizing the killing of innocent civilians in a movie theater." In other words, how dare you use your rights to say something that offends me. No word on whether Mayor Nancolas is condemning Barack Obama, Joe Biden, Andrew Cuomo, etc. 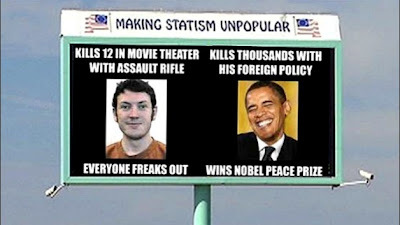 for "politicizing the killing of innocent civilians" in Newtown by using the tragedy to push through gun control measures. Although, to his credit, the Mayor did speak out over a National League of Cities "letter advocating a ban on certain weapons." It was almost exactly a year ago that I published my first post here on guns and the Second Amendment. In the wake of the ongoing post-Newtown massacre gun control frenzy here's another. I'll try to actually write something in the next week or so but for now a link and a couple videos will have to suffice. The link is assaultweapon.info and the videos are below. If you are offended by profanity then skip both videos. If you are offended by Jackie Mason (I know I am) then skip the second video or fast forward through the short segments featuring him. Click here to view the public service announcement that inspired the second video. This is a fun song that reminded of some of Feist's music. The science is interesting, the cinematography is good, and the 3-D effects are spectacular. I saw the film on Thursday at an IMAX theater packed with young kids and their parents. The kids kept reaching out and trying to touch the butterflies, I felt like trying myself a couple of times. Source: George Will, International Herald Tribune. May 7, 1990 as qtd. in The Columbia Book of Quotations by Robert Andrews (Columbia UP, 1993) p. 341.